After a long week of researching and gathering ideas together I feel that I have started to pull the concept and my ideas into something that is strong. Talking to Chris last week I was slightly off track and felt confused in which way my project was heading, so for this weeks lesson I have put together a folder where each wallet has an individuals memory, some photographs of them and some drawings that I have started to create to put within the book. The idea of these drawing came after talking and sharing my ideas with my housemate, I started drawing ideas down for the shoots that I wanted to create. From this, and always having a love for drawing it started the idea of having something more personal from myself that I could include within the book. Putting this folder together has really helped me see what have for each person and made it clearer, along with drawings and scanned in images I have picked out keywords and objects from the memory I was given so that if I go ahead with this idea of doing a still life and portraits I can easily see the objects and location I need to use for the individual person. However, the problem that I think I am going to face is finding different object that are rather odd or unusual to put with in the still life images, such as Juke boxes, old televisions and pianos. None of these are easily available and certainly not always going to be in the right location in which I am hoping to shoot the images in. So for next week I am going to start phoning different place to see if I can shoot in locations or if people can help me out with the obscure object I am going to need. Other things I have to consider after to talking to Chirs is how am I going to display my drawings and what are the drawing going to be of? We discussed about maybe printing the drawings onto tracing paper or acetate so they are transparent and you can either see the portrait, still life or maybe putting a snippet of the letters that were given to me in the first place. This idea of making it see through or partially see through gives it a ghostly feel which ties into the concept of it being a book on lost loved ones or friends that have past away. This is only one part of the chapter for each person I need to continue researching in different layouts in which could influence the way in which I layout my book, I plan on going to the library to look at the photography and fashion section and particularly looking at some of the photographers and artist I have previously researched and new ones such as Sally Mann and Guy Bourdin. I feel as if I have plenty to do in the next week, researching ideas and continue doing drawings. So after looking at the work of Kander for my portraits in my book, I thought it would be a good idea to research some photographers for the still life work I am hoping to create. I need some inspiration of how to make my work stand out. One influence comes from, Juergen Teller a fashion photographer and artist who was born in Germany who at the age of 22 moved to London. However before moving he studied at the Bayerische Staatslehranstalt für Photographie in Munich. Since being in London Teller’s fashion photography work has been featured in books, magazines or exhibitions, including The Face, Vogue (US, France, England, Italy), Another Magazine, Index, W Magazine, Self Service, Details, Purple, i-D and 032c, among others. Many of his pieces of work he prefers to have in colour, and regularly includes himself in his photographs. Below you can see one image that includes himself in the background, the image on the right hand side is Kristen McMenemy taken in 1996. Gaining wider recognition in 1996 from the photo above, he then began collaborating with Marc Jacobs in 1997. since this Teller has shot campaigns for the brand and the 2005 campaign, he photographed himself with Cindy Sherman. Other collaborations for Marc Jacobs campaigns involved, among others, Winona Ryder, Sofia Coppola, Charlotte Rampling, Michael Stipe, Rufus Wainwright, Harmony Korine, and Roni Horn. Teller has also had long collaborations with other designers and fashion houses over the years including Helmut Lang, Yves Saint Laurent (since 2005), Vivienne Westwood. He has recently collaborated with Céline. He frequently works with the musician Björk. Teller has also photographed many artists, including William Eggleston and Roni Horn. It goes without saying that he is regarded as one of the most influential fashion photographers working today. His work inspires me to create some risky and controversial still life imagery by picking out the main points. So from this I am going to organise a scrap book together of all the letters I have received of memories, photographs and drawings, this firstly give me a clearer view of what I need to plan to do as well as having each chapter/person separate to start bringing ideas together and organising what photo shoots I need to start putting together. Nadav Kander is a London based photographer, artist and director, and particularly known for his portraiture and landscapes and began taking pictures when he was 13 on a Pentax camera. A lot of his later work is included in the collections of the National Portrait Gallery, the Victoria and Albert Museum and other galleries and museums. After being drafted into the South African with his parent and going into the Air Force, Kander worked in a darkroom printing aerial photographs but moved to London in 1986. 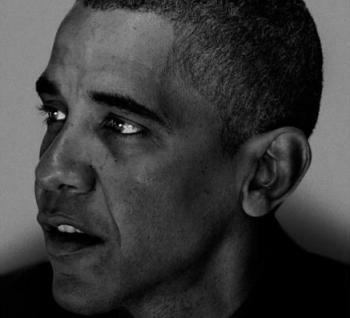 One of Kander's most celebrated images is his 2009 portrait of Barack Obama photographed for The New York Times Magazine as a cover feature. Below you can see one of the images of Obama and Sir Ian McKellen. On 18 January 2009 Nadav Kander had 52 full page colour portraits published in one issue of The New York Times Magazine. These portraits (from a series titled Obama's People) were of the people surrounding President Barack Obama, from Joe Biden (Vice President) to Eugene Kang (Special Assistant to The President). The same issue also included a series of cityscapes of Washington DC also taken by Kander. This is the largest portfolio of work by the same photographer The New York Times Magazine has ever showcased in one single issue. As you can see above is some of the portraits that Kander has photogrpahed, these images particularly interest me and are something I am looking at in putting along side the still life images in my book. Putting portraits within the book will add some continuity and hopefully showcase my make up skills. The other reason for looking at Kander is looking at his style of portrait, how he uses lighting as well as using black and white to create mood. From looking at the portraits it is clear to see that it is Kander's work, moving on with my work I hope to do some test shoots for my portraits so I can see what works for me and start my own style to put in the book.